Our hottest, most effective cleaning rinse ever. 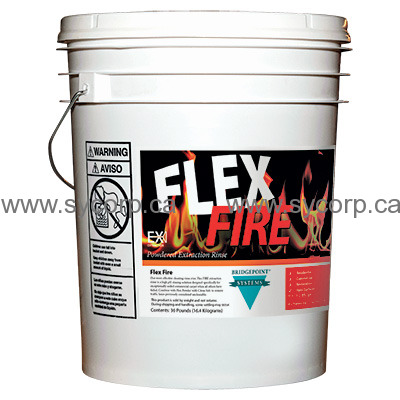 Flex FIRE extraction rinse is a high pH rinsing solution designed specifically for exceptionally soiled commercial carpet when all others have failed. Combine with Flex Powder with Citrus Solv to remove traffic lanes previously considered uncleanable. For truckmount concentrate: Add 1 to 2 cups of Flex FIRE rinse to five gallons of cold or warm water. Mix thoroughly until dissolved. For systems metered on low settings, or for excessively soiled carpets, 3 cups may be used. For portable equipment: Use 1 ounce of Flex FIRE rinse per 5 gallons hot water. For extra heavy soil use 2 ounces per five gallons of hot water.